Black Widow Sanctuary: Where's my Fall at? Samhain is only a week away and I have been such a turd. Normally I would have made many Samhain/halloween/kekri posts like earlier years, but it's just been so hard to do anything. But anyway I'll try not to make this post a complainy one too. Just to summarize: Stress, stress, stress. For some reason I have been into buying vintage stuff lately. 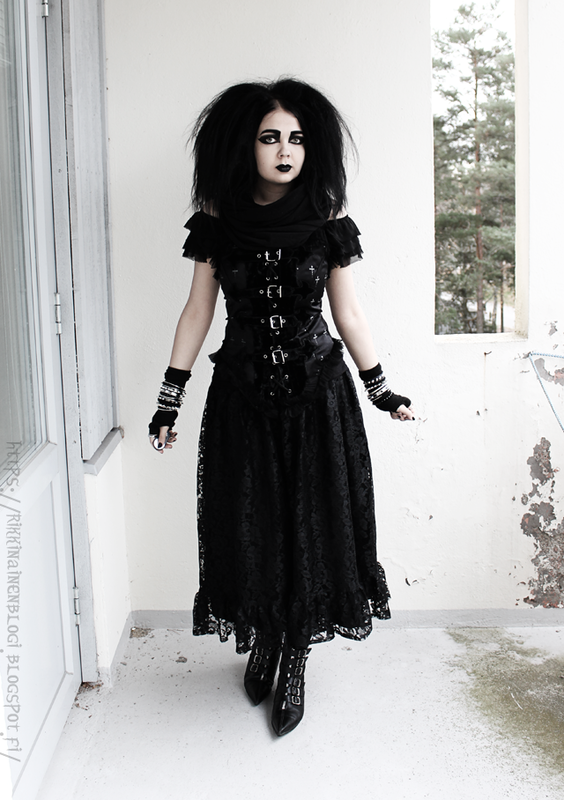 Like this wonderful lace skirt that I have on. I also found this Raven bustier on ebay second hand. For some reason I have been hoarding bustiers recently. I just love how they look on me. This one is not a perfect fit since it's slightly loose, but it's still good enough for me. I'm not quite sure if the scarf goes with the outfit, or maybe if something else would have looked better, but I just felt like I needed the scarf for emotional comfort today. It's been cold, oh so very cold. Where did my fall go? It feels like the time is slipping through my fingers and there's nothing I can do about it. Yesterday we went to Pori and stored my boyfriends motorbike there for winter. Just in time too since it kinda looks like it will snow tomorrow maybe. I hear there has already been some snow in the inland, I'm happy that it always comes a bit later in these coast cities. 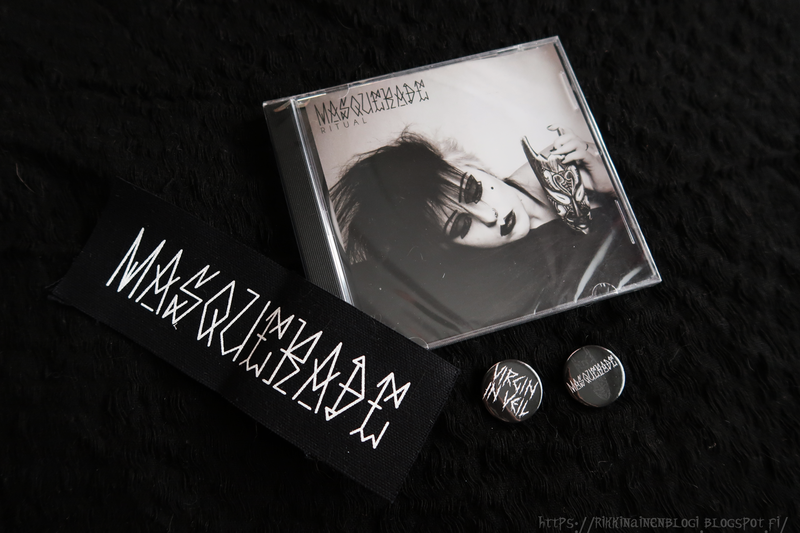 I also made a order to http://masquerade.fi/ and got the Ritual as a physical CD. I already have this one as and LP and as a digital copy, but you just can't support your favorites enough. Also I still have a habit of collecting CD's. Jacques was so kind to keep me posted all the way through the order and he even sent me an extra Virgin in Veil button! So happy! Like a week ago also my pre-order arrived! It's the Ukon Pakka - Kalevalainen tarot by Susanna Salo. I adore all illustrations in this deck, it's so gorgeous! 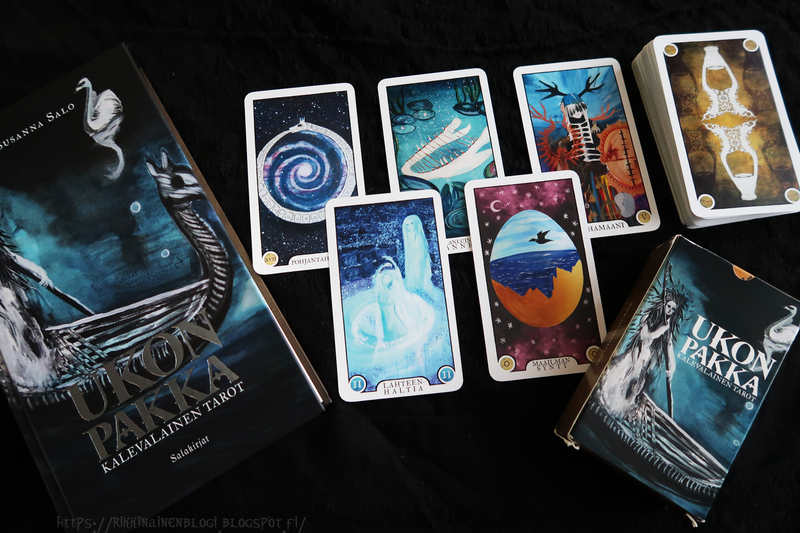 I also have a another Kalevala deck already by Kalervo Aaltonen but somehow I prefer this one more. Even though as a occasional Tarot reader I still find it a tad confusing, but I'll get the hang of it! Here are just some of my this years booty of Halloweeny items. Mostly skulls yes. I have more and more but they are all scattered across the apartment and closet etc. Most of the things I got were from Tiger, they had really nice stuff this year! 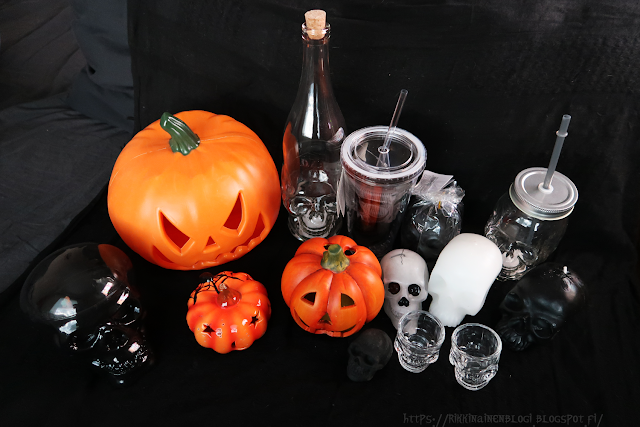 Like the big pumpkin, the bigger skull candles, the drinking cups, the skull bottle, the shot classes and so on. Lately I have been getting in to Elder Scroll Online again. Also our little tiny century old tv in the bedroom broke. So I dragged my big screen and my PS4 in there and made my little gaming nest in there. And it's nice to watch netflix etc. 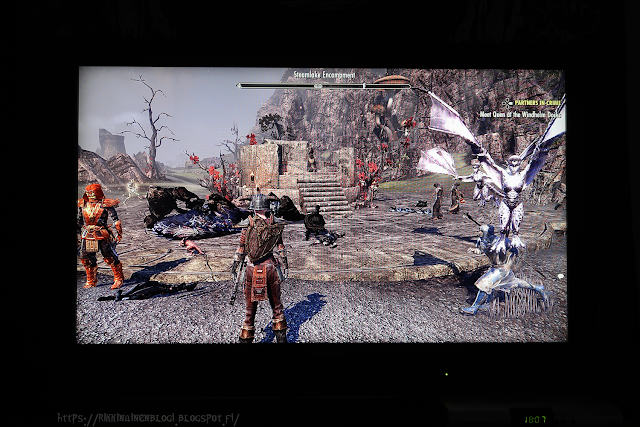 before going to sleep or collect a bit of halloween items in ESO... Just need my fort of de-stressing right now. I'll hope to update a little before Samhain time, but if I don't, I hope you have a amazing Samhain or Halloween or what ever floats your boat! I love your entire outfit you always have such amazing style. I love the fact most of its second hand finds. Great Halloween finds, in my city we're lucky to enough to have a Tiger shop. There Halloween stuff has been awesome. 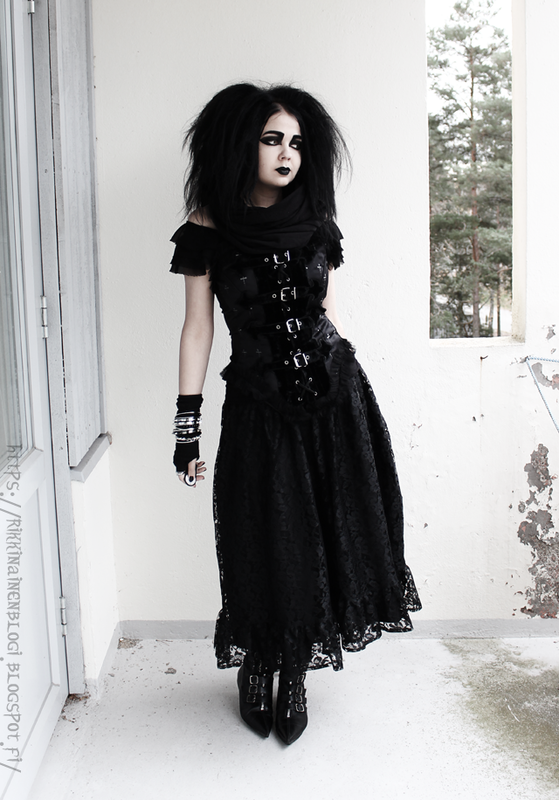 That bustier looks gorgeous on you, great find ) Blessed Samhain! Looking great, as always <3 And take care. I've recently purchased ESO but haven't gotten into it that much. But I was a huge fan of both Skyrim and Oblivion. Do you have Overwatch? They had a special Halloween event that got me back into it. Happy (late) Samhain! Oh me too! And Morrowind too! Nooo, sadly I really never got the Overwatch thing, it wasn't really for me. Kävin itsekin Tigerissa "vähän" ostelemassa :D kaikki noi lasitavarat piti tietty saada ja hiusklipsuja ja vaikka mitä, siellä oli tosi hyvä valikoima tänä vuonna!